MeterSafety - Summit Utilities Inc. IF YOU BELIEVE YOU HAVE A NATURAL GAS OUTAGE, EMERGENCY OR QUESTIONS ABOUT YOUR METER, CALL 800-909-7642. Although natural gas equipment is designed to withstand harsh weather conditions, damage can be caused by snow and ice accumulation, as proper ventilation is required to keep equipment running smoothly. Vents for natural gas appliances prevent the accumulation of carbon monoxide within buildings, and ensures combustion equipment operates properly. Customers should check the vents on their home or business and remove any snow or ice from the area. Additionally, Summit Natural Gas encourages all customers to check and test their carbon monoxide detectors to ensure the equipment is working properly. The natural gas meters should be kept clear of ice and snow to avoid damage to the equipment and the meter should remain visible and accessible for maintenance personnel. 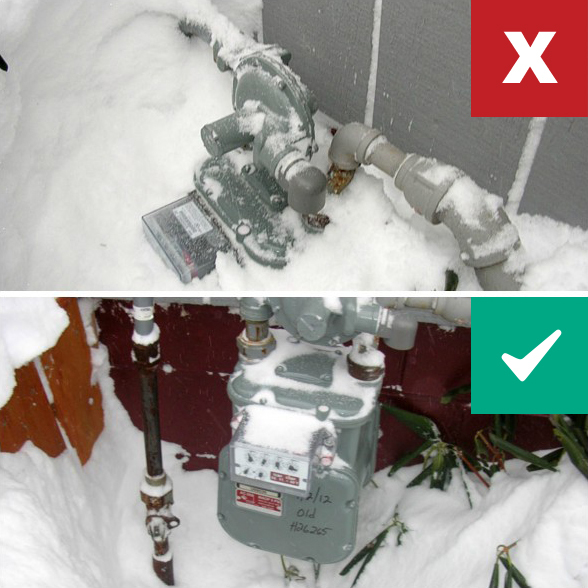 Snow and ice should be removed from natural gas equipment as gently as possible, using a broom rather than a shovel or kicking the meter and pipes. Damage to the meter can also occur from overhead hazards, and customers are encouraged to remove icicles from overhead eaves and gutters to prevent dripping water from splashing and freezing on the meter or vent pipe. Remove all snow and ice on your gas meter as well as all piping. Carefully shovel all snow around your meter and move it away. Ensure quick access to your meter by shoveling a pathway to your meter. This is important in case of an emergency. Check your meter regularly to ensure there is no snow and ice accumulation. Call us immediately if your gas pressure regulator vent is blocked or you have any concerns pertaining to its proper function.